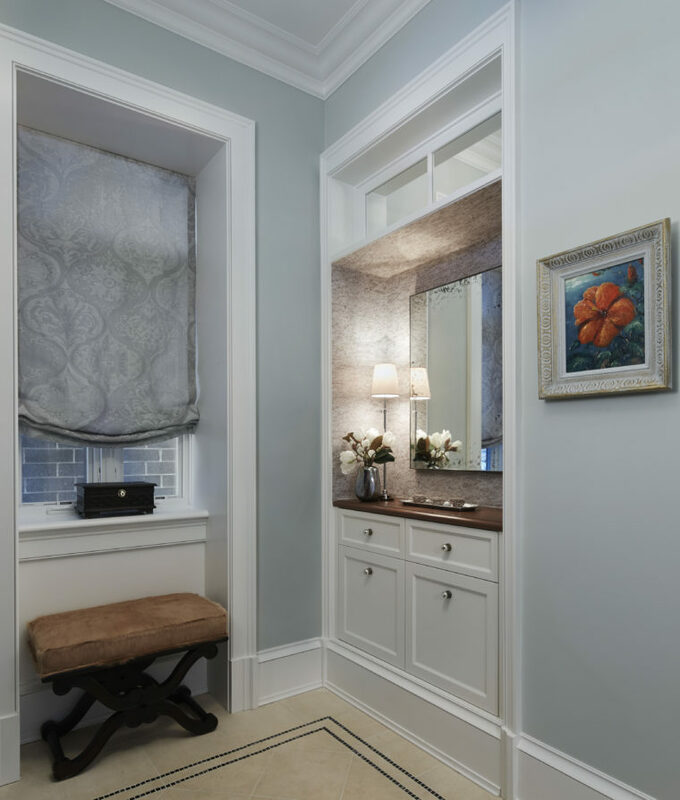 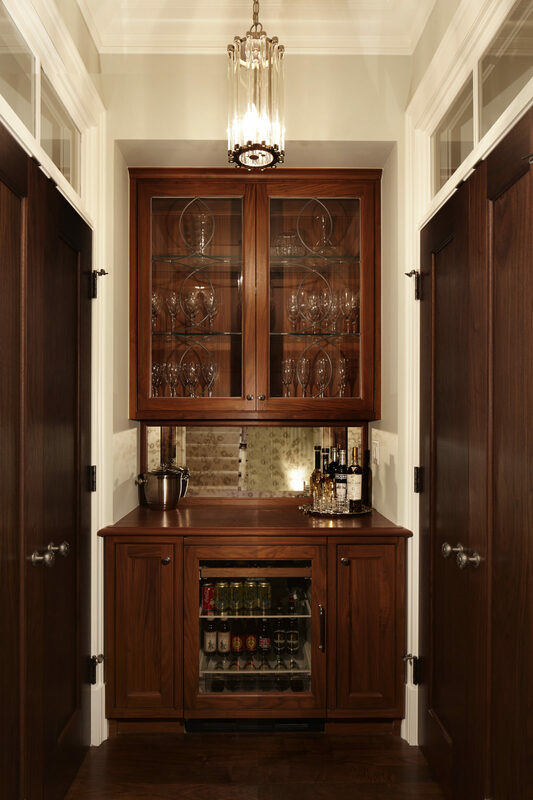 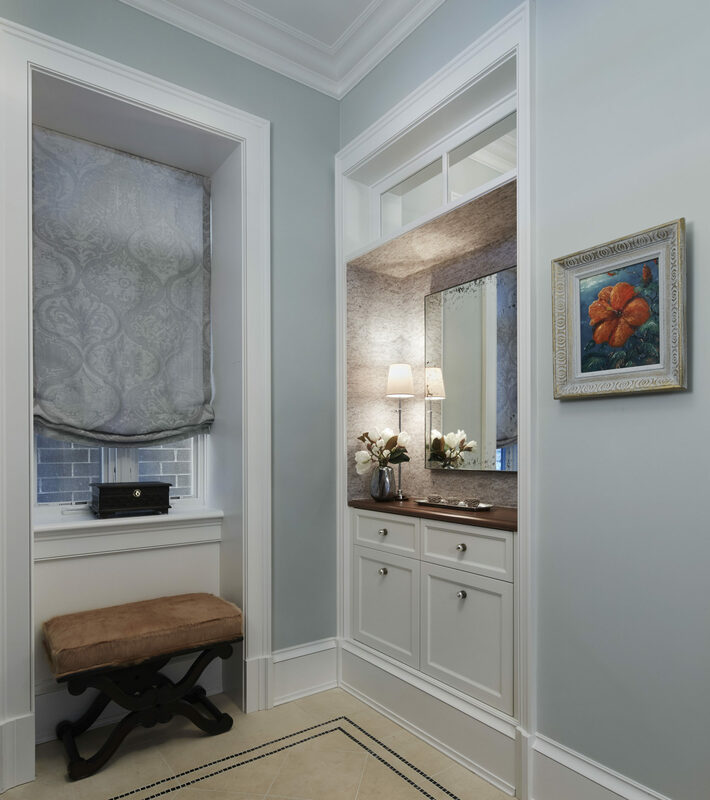 Custom niches were designed within the entry as well as a walnut bar with leaded glass in another small space. 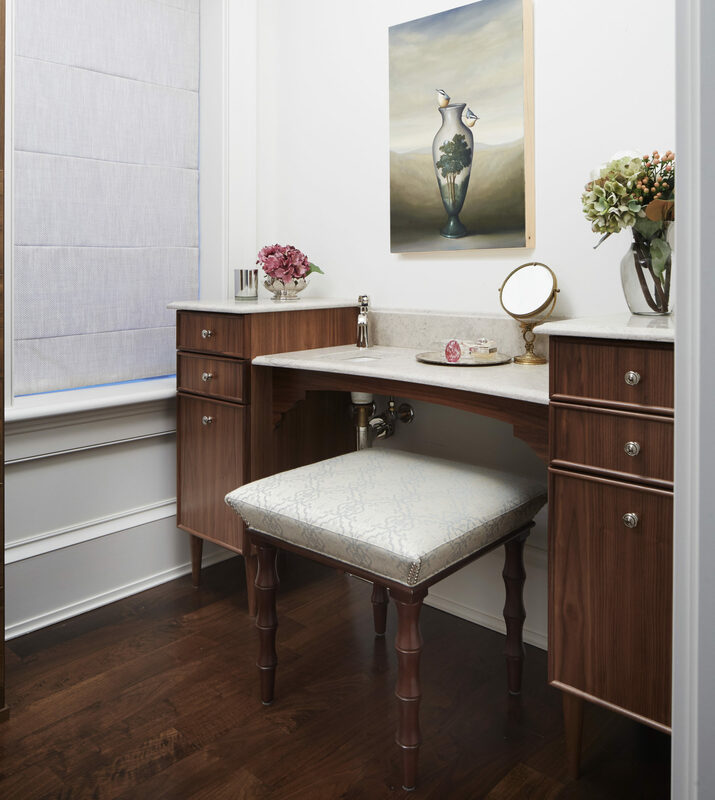 Antique mirrors were used to help make the spaces feel larger. 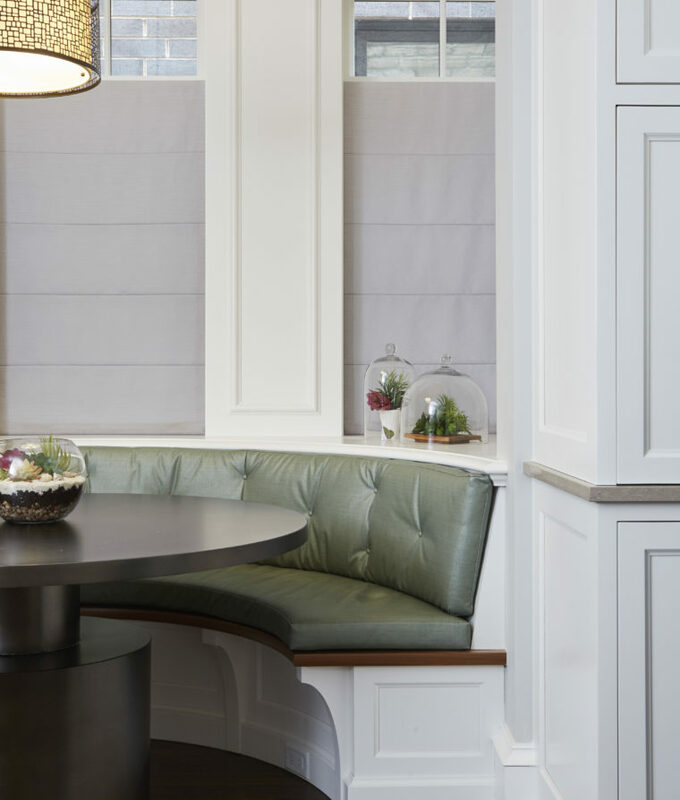 A Robert Abbey chandelier adds sparkle to the bar. 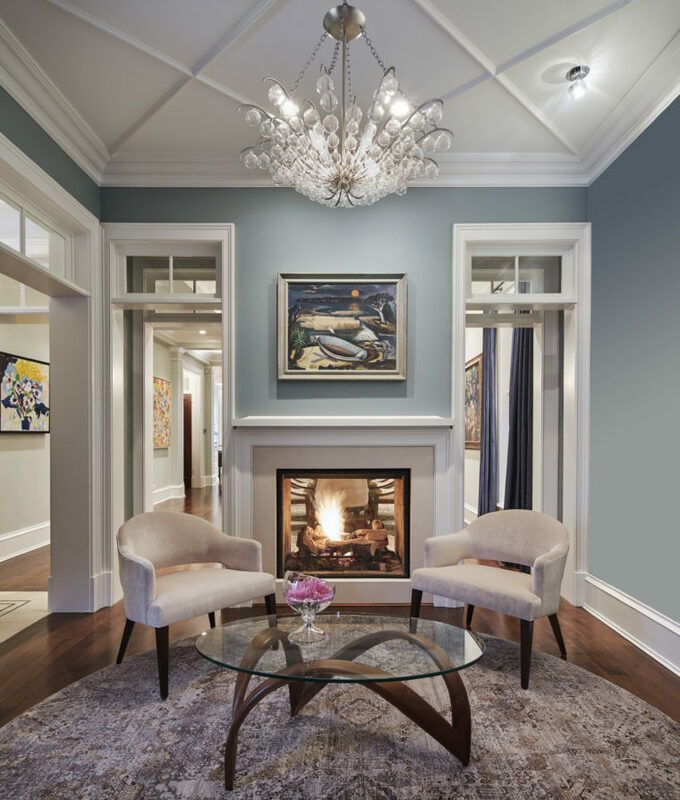 Although moulding details were to the ceiling to add interest in this formal sitting room, the Currey chandelier is the star of this room. 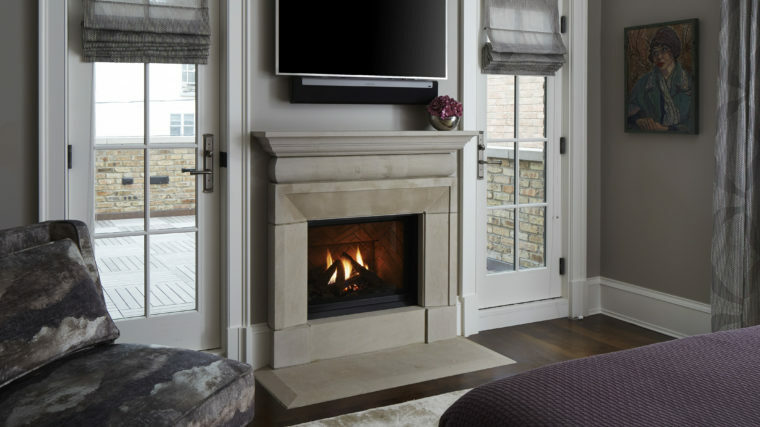 Chairs from Kravet add cozy seating at the fireplace. 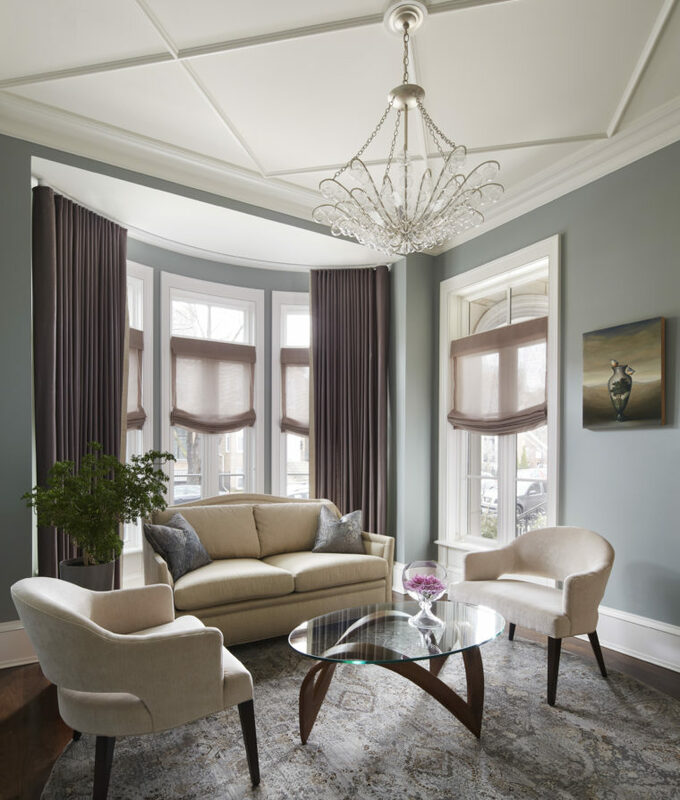 The walls are painted Benjamin Moore Greyhound. 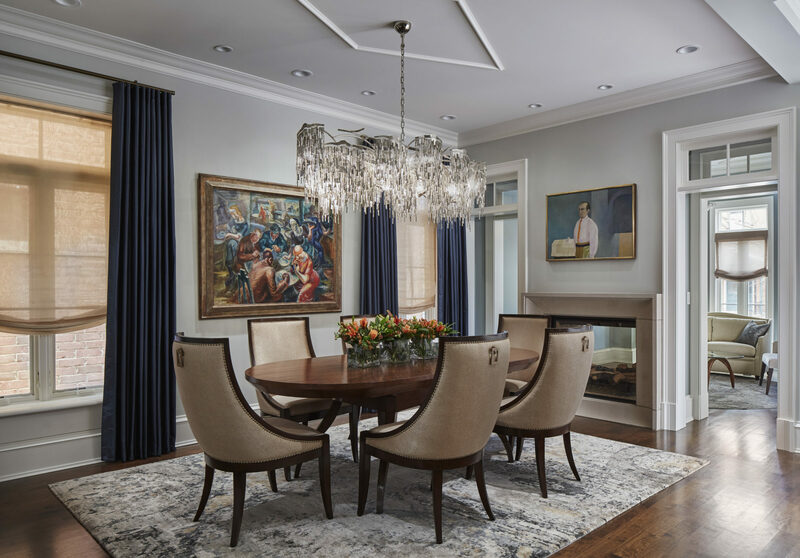 A Robert Abbey chandelier adds sparkle to the bar. 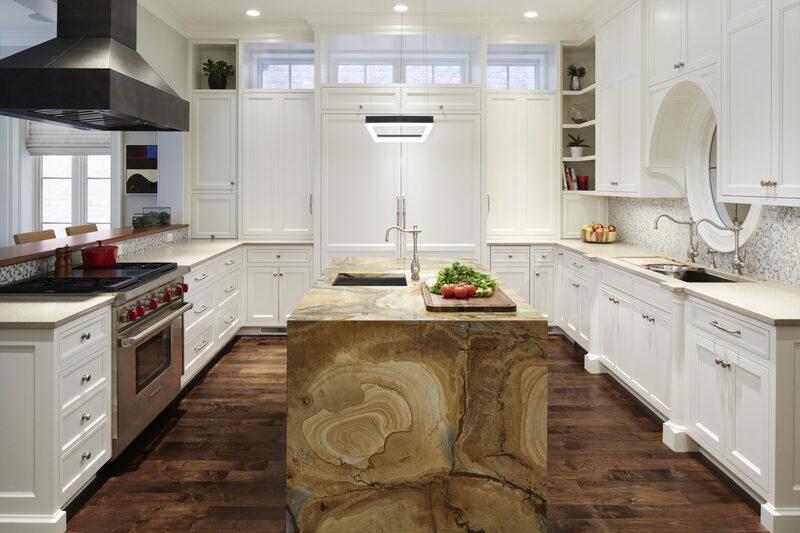 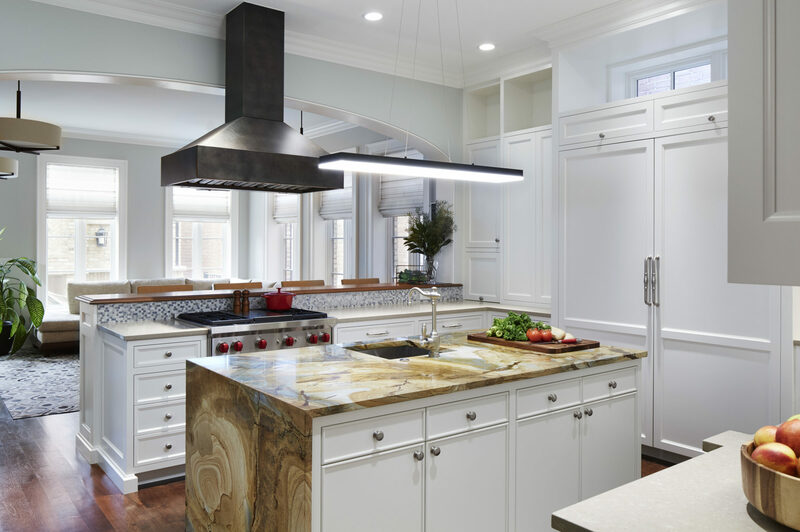 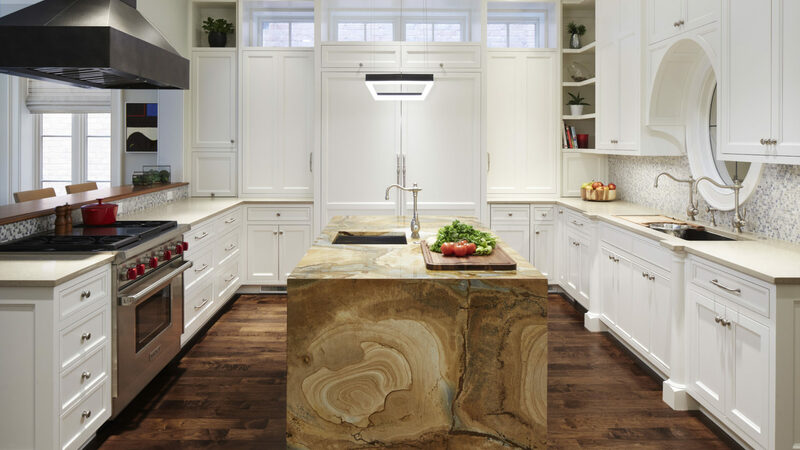 Quartzite was used to make the kitchen island a focal point in this white kitchen. 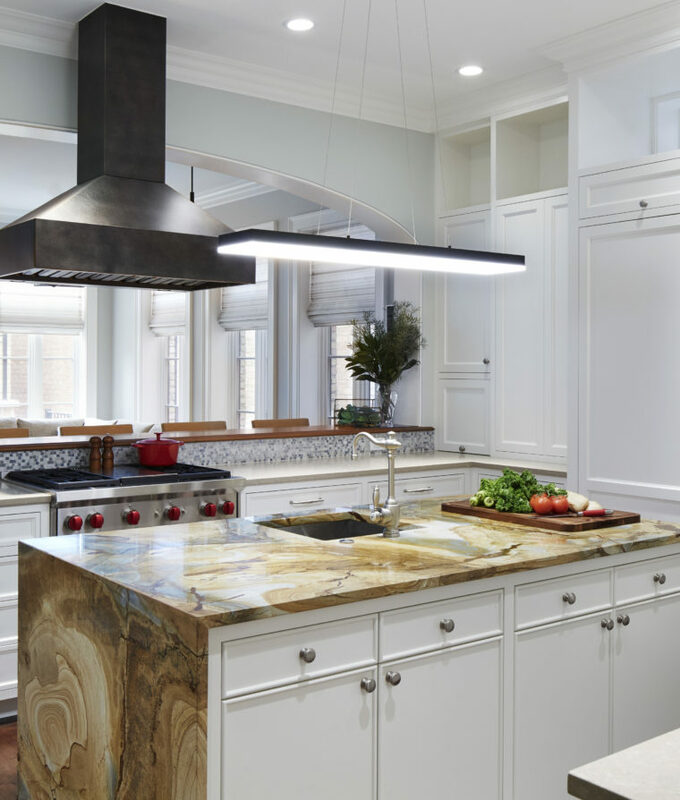 Perimeter counter tops are Caesarstone and a custom metal hood is installed over the Wolf range. 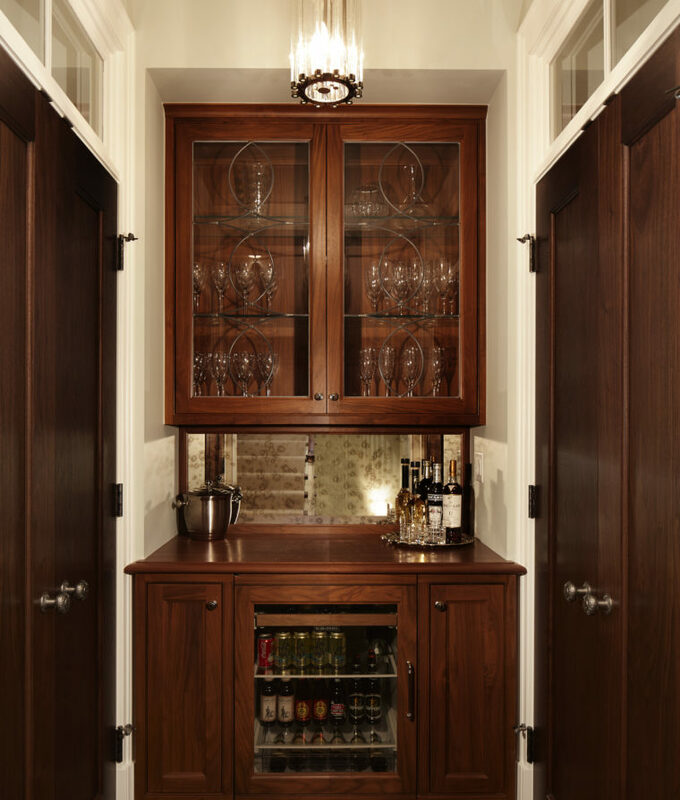 The refrigerator as well as other appliances are hidden behind custom designed panels. 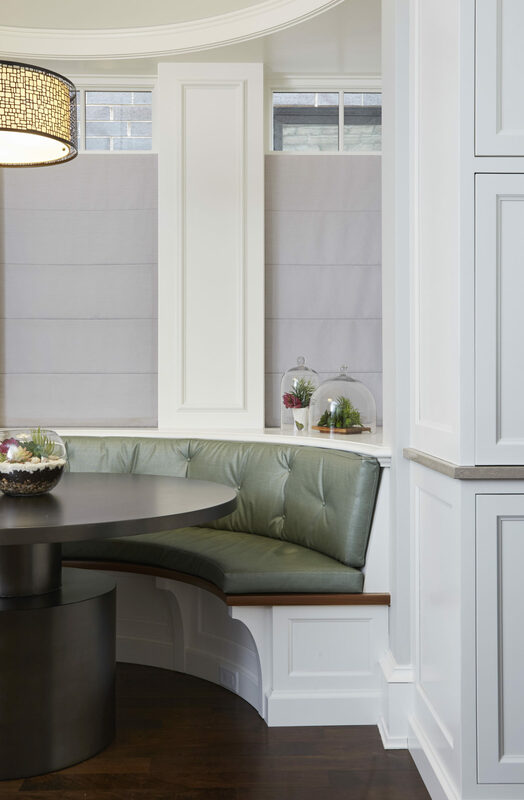 The elliptical shaped custom banquette is upholstered in Holly Hunt fabric, and a custom metal table completes the breakfast area. 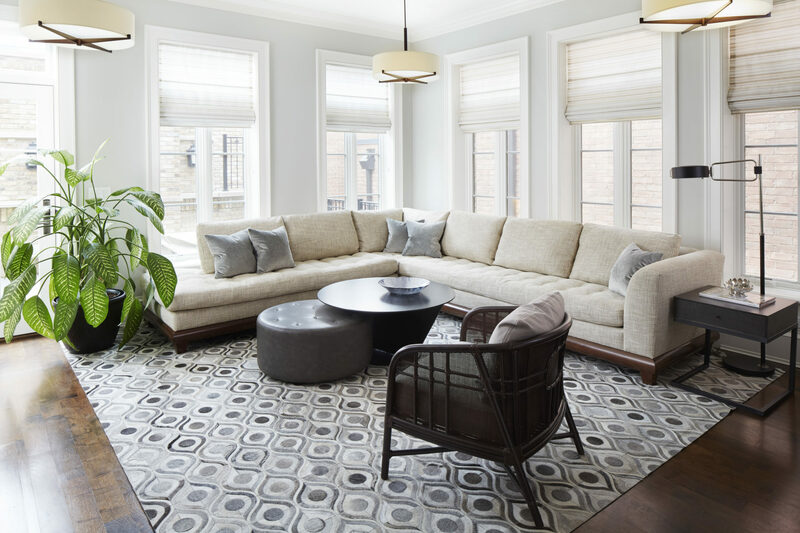 A modern A. Rudin sectional rests on top of a hide hair rug, while a Baker lounge chair with it's cane back adds texture to the sitting area adjacent to the kitchen. 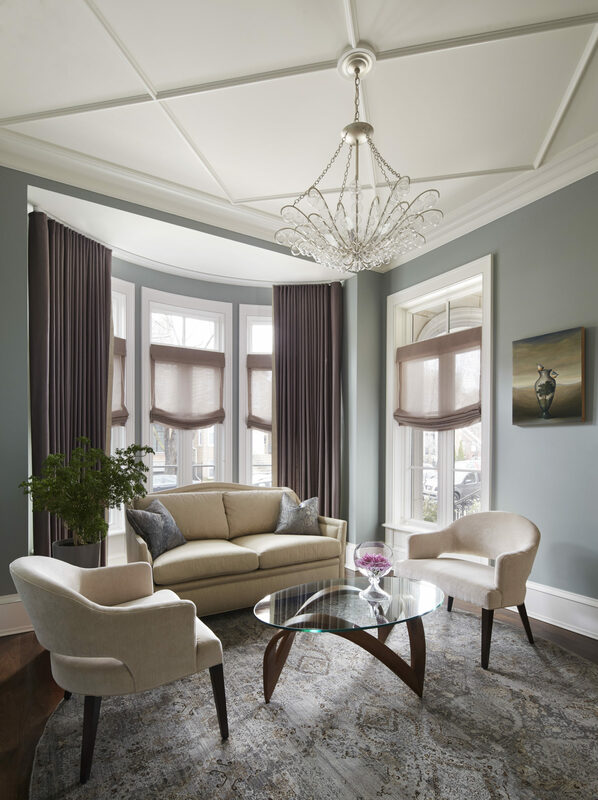 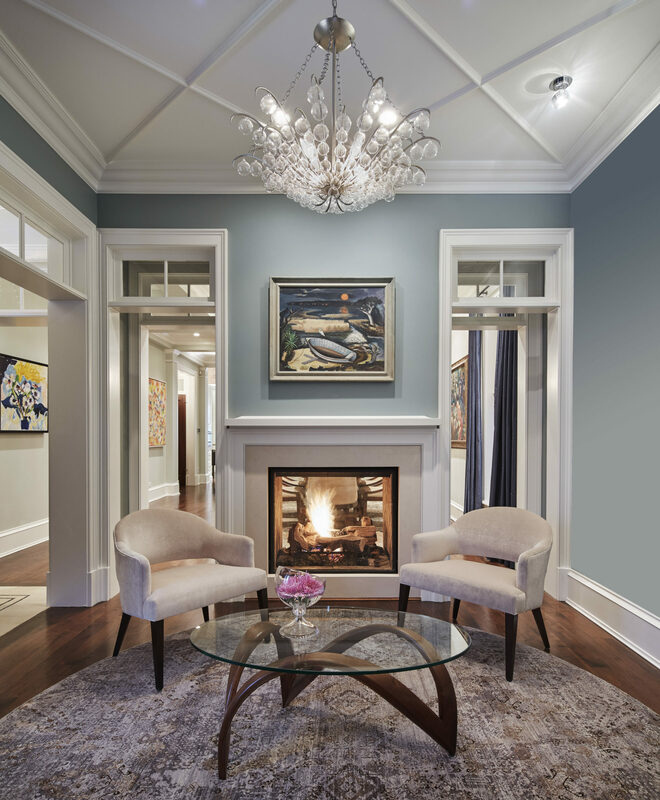 Beautiful pendants from Lightology help anchor the room that is are painted Benjamin Moore Gray Owl. Morgante Wilson designed this custom upholstered bed with wood accents to be the centerpiece of the room. 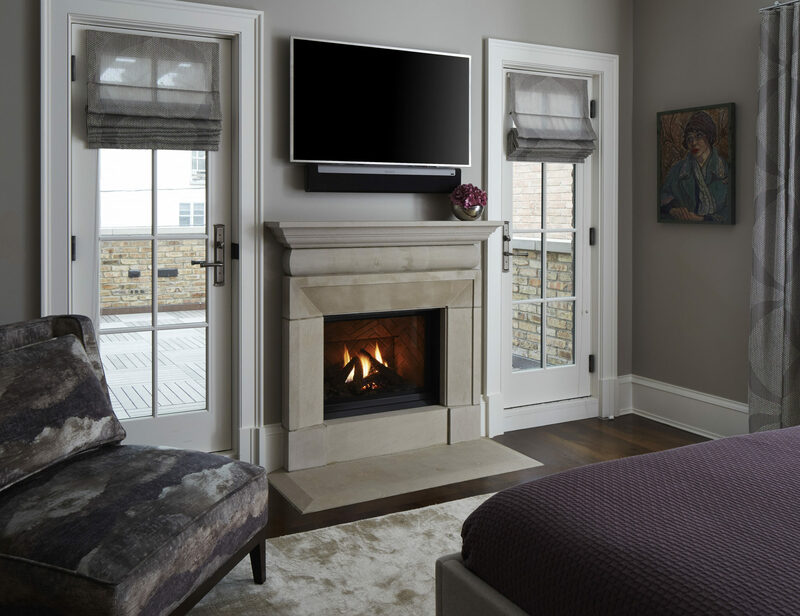 Noir nightstands are topped with Visual Comfort crystal table lamps, a custom limestone surrounded fireplace is nestled between french doors opening to a private patio and a lush viscose rug and a comfy lounge chair upholstered in Opuzen fabric add more glamour to this Master Bedroom, but the most unique feature of this bedroom is a custom walnut make-up vanity with a limestone top where a small Kallista sink adds unparalleled convenience. 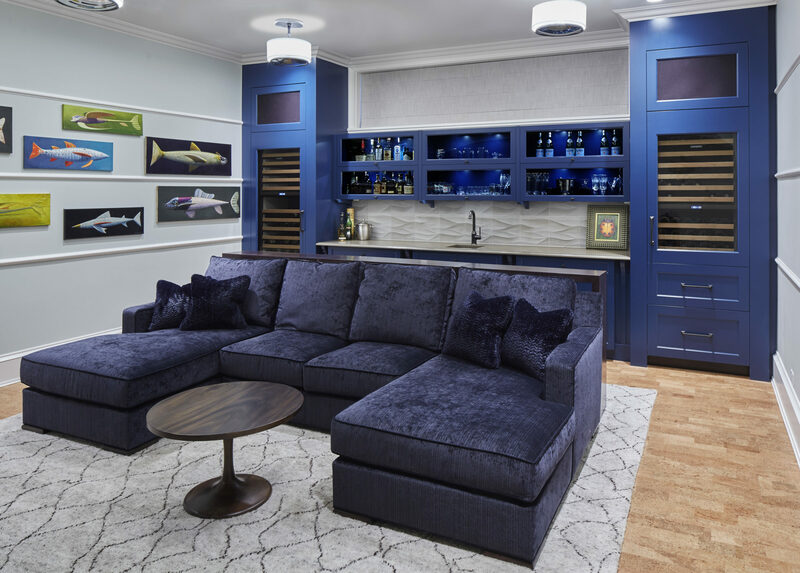 A Kravet sectional that has been upholstered in a navy velvet, lighting from Visual Comfort as well as a sound insulating cork floor adds a masculine touch to the home's hang out room.